CHITWAN, Nov 18: Raman Mukhiya of Rautahat landed in Chitwan a month ago. He is going to stay a few more weeks and intends to return only after making ‘good money’. “This time of year is for earning money. I am working hard day and night,” said Mukhiya. 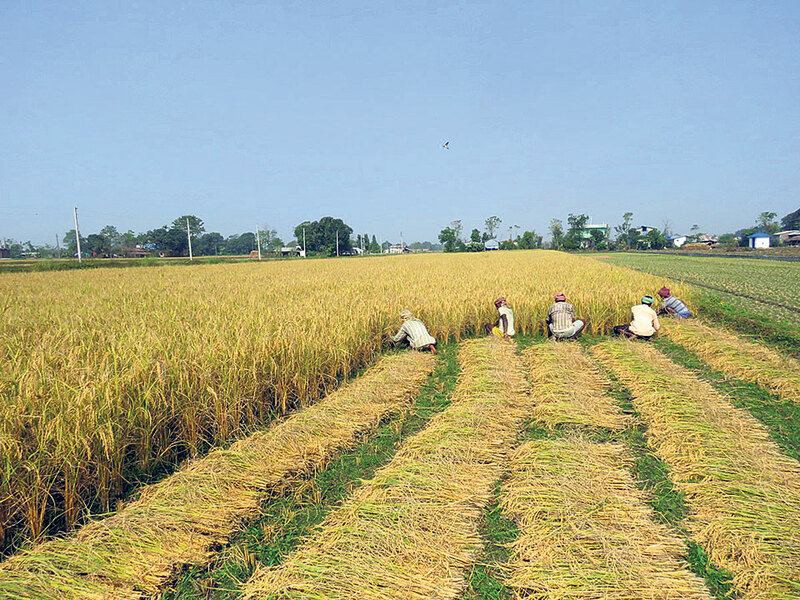 Landlords in Chitwan harvest paddy during this season. And this gives work to workers like Mukhiya. In fact, Chitwan is so much short of local workforce that it cannot afford to ‘anger’ laborers who come from other districts. Since the last 10 days, he is working western Chitwan. Before that, he worked in the eastern part of the district. “I have been working here since the last 10 days. I will go elsewhere from here once I complete the work here,” he shared. Presently he has taken up contracts for harvesting paddy in Geetanagar, Shivanagar, and Fulbari area. “I will be harvesting huge swaths of paddy fields. I have harvested these fields in the past as well and I am familiar to them,” he said. Mukhiya has been harvesting paddy in Chitwan for a decade now. During these years he has worked in almost every nook and corner of the district. He shares that this seasonal work in Chitwan provides him with the most reliable income. He does not come to Chitwan alone. Every time, he is accompanied by other laborers. This time, he is accompanied by seven co-workers. “It is easier to work when you have your own team. On one hand, the landlord does not have to look for other laborers on his own and on the other hand, it is convenient to work with team members you know,” Mukhiya explains. Since the last few years, laborers in Chitwan have become quite scarce. This has forced landlords to seek laborers from other districts like Siraha, Saptari, Rautahat, Dhanusha, among others. It is not just the harvest season that the laborers are sought in the district, they are equally in demand during the paddy plantation season. He shared that he has a special sickle, which he brought from Punjab, India. He never shares it with his coworkers. According to his team member Bir Kishor Ram, 38, Chitwan offers pretty good wages and they save most of it. Food is often for free, and accommodation is not expensive as they live in a group. “We spend only when we want to eat something extra or throw a party,” he said. Ram did not go home even in Chhat stating he could not afford not working. He is okay with his decision as his friends did not go either. “Chhat is our great festival. But we have work to do here, it is getting late for harvesting paddy. Moreover, it is like another festival here with all the friends around. None of my friends went home in Chhat. I feel fine,” he said. After harvesting paddy, the labors thrash it and help it store safely. They charge Rs 16,000 for one biga of land (72900 sq feet). 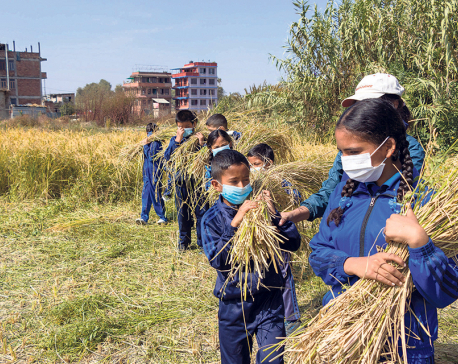 The group has already harvested paddy of several landlord families this season. When he gets work in Nepal, he works here. When he is free, he goes to India searching for work. According to Ram, labor charge in Nepal is better and savings are better. Mahakant Sadaula of Bharatpur metropolis who has deployed such laborers for many years is happy with their work. He was full of praise for his laborers. Even if they didn’t do good work, they don’t have other options, he said. “We have grown old. Children have become lazy, they don’t like to work on the farms. Finding laborers around here is not easy. These men come from other districts and have been keeping it going so far,” said Sadula who owns several bighas of land.